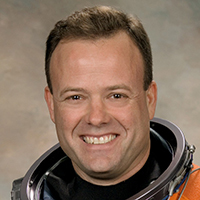 Ron Garan USAF (Ret.) is Chief Pilot at Word View Enterprises. Garan is a highly decorated combat Fighter Pilot, Test Pilot, Explorer, Entrepreneur and Humanitarian. Garan traveled 71,075,867 miles in 2,842 orbits of our planet over 178 days in space and 27 hours of EVA during four spacewalks. He flew on both the U.S. Space Shuttle and Russian Soyuz spacecraft. Garan is also an aquanaut and has conducted research in Aquarius, the world’s only undersea research laboratory and is author of the highly acclaimed book, The Orbital Perspective.